Well this time I was adamant that I was going to get into Nettle Pot, but to be honest I wasn't so sure it was the wisest decision I had made once I had reached the bottom of the entrance shaft. I think the best way I can describe this cave, is one that doesn't like you to get in, and tries even harder to stop you getting out once you are in. I struggled to get in and if it wasn't for gravity I recon that I would of got stuck on more than one occasion, I almost had my head torn off by my helmet when my helmet got stuck, and my poor old ribs will never feel the same again. Once I had made the bottom of the shaft I decided I wasn't going to go any further, I was going to save my energy for climbing out. Steve and Mell had a quick poke around but only Steve went on to the next pitch, after eventually finding the way on while trying to avoid falling into one of the deep pots as he crawled carefully past them. On the way out I really struggled up the shaft once I had got passed the Sentry Box, as I couldn't bend my legs and ended up just pulling my self up by my arms for most of it, and i've got the blisters to prove it! I have to say it, it isn't the nicest cave i've been in, but I will go back as I don't like being beaten. It was third time lucky for me and Evan from NWCC as 'Danny' had been flooded on our last two attempts. To ensure that we really appreciated the beauty of Dan-yr-Ogof, Brendan and Keith took us into the Syphon Series first. Or was it to remind us of some North Wales Caves? Or to tone down my bright orange and blue Newquay-surfer wetsuit? Or revenge for the OHA-to-the-sump trip? Anyway, with water levels low, the ducks were easy to pass but the place is a mud bucket! We came out looking like the Black & White Minstrels. Evan and I ooed and aahhed our way around the usual sights, Straw Chamber, Cloud Chamber and Flabergasm Oxbow, where I was worried that I would somehow manage to trip, catch or otherwise break the long straw column. It looks so delicate, but it's calcite, so hey, you could probably belay of it. The Long Crawl was not as long as I had imagined and has a lovely draft. On the other hand, the Green Canal was longer, 300ft and the water is very, very cold but I was toasty in my wetsuit. It is difficult to swim and the idea is to bounce off the edges, preferable without puncturing your inner tube floatation aid and sinking into the bottomless void. The others got fed up of me singing 'Aqua Marina' (from Stingray, for those of you born after the 1960s) but the acoustics are fab. I had to traverse Go Slower Passage four times with Keith saying 'look professional' and me trying not to laugh and not to fall into the void below but he filmed Evan in the Long Crawl, so I don't know how many times he made him do that in the interests of 'Art'. The video clip is up for a very short while on YouTube: http://www.youtube.com/dcrtuk. On the way out, we became a 'Cave Refuse Team' and brought out old hosepipe and other rubbish which had been left in a neat pile for any volunteers going out. It was fun pushing and pulling it through the long crawl particularly for Brendan, who brought out twice as much as the rest of us. Rottenstone Avens, named the Minuteman Silo by the original explorers, are a pair of immense interconnected avens, that are passed through on the route to the Rising. These were originally climbed in 1970 to reach what was intriguingly referred to as a "floorless chamber". Recently these avens have been reclimbed by Richard Frost in his quest to explore the higher level leads in DYO. At the top of the avens, the "floorless chamber" has a fantastic flat roof that is covered with a multitude of straws and stalactites, that Richard wanted to be photographed. The plan was to climb the avens, photograph the roof and then go and look for a "strange area" that was reported by Dave Judson and Glyn Edwards after their visit in August 1970 to contain a vast array of impressive helictites, blue and green tinted aragonite and gypsum formations. At the top of the pitches a loose mud and boulder slope rises up to the fantastically decorated roof. At the top of the slope you have a commanding view of this "floorless chamber". We stood motionless at the top as the party climbed the aven one by one, to ensure that no rocks were sent hurtling down the 30m aven to the cavers below. Once all up, I tried to take a photograph of the roof. The camera refused to play and no matter what I did to it or what mode it was set in, even removing the battery and memory card would not shake it into life, so the photography was knocked on the head. An old hawser rope installed by Judson and Edwards dropped down the mud and rock slope to a narrow mud and boulder bridge that led to a larger ascending slope on the opposite side of the chamber. A belay was set up and Richard was lifelined across the top of this abyss, where at the other side he placed an anchor so a good rope could be installed to protect the crossing. At the other side the slope rose another 30 feet above the level of the roof to lead to an area where two alcoves containing the magnificent formations were located. Gareth and Keith followed to join Richard in the exploration of this part of the chamber. An array of formations unlike those seen anywhere else in Dan Yr Ogof were found, but no sight of the blue and green tinted formations mentioned in the 1970 report could be located. After a few weeks of dry weather, and now with a new set of beefy pumps, the prospects looked good for a productive weekends digging. By Thursday evening only Keith and Brendan had committed to going and we reluctantly packed up the pumping gear that evening. It looked like all that we would be able to do would be to install the new pumps, when the mill door swung open, and in walked Bartek and Paulina. 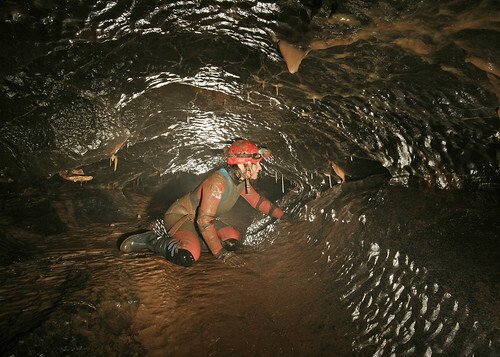 Is anyone going caving this weekend? they asked. Keith looked at Brendan and then said well sort of... and so was hatched a plan, in return for help setting up the new equipment in the dig, we would arrange a nice caving trip for them in the afternoon. Arriving at the dig we first popped down the bottom to asses the state of play. Water was a foot lower than when visited two week earlier, so was going to be easily pumpable. We set about installing the header tanks into which the new pumps would sit, plumbing them into the existing pipework. The rigid yellow pipe proved difficult to connect to the tanks until an ingenious idea was thought up. A large teapot was filled with boiling water and transported back to the dig, after as short spell under the flow of boiling water the pipe slid onto the connector to form a watertight seal. Tanks were set up half way up the rail track and also to the side of the middle pool. Once in place the pumps were dropped in and the generator fired up into life. The lower pump filled the higher header tank which was then in turn pumped up to the surface. The float switches activated the pumps as needed, so once connected they could be left unattended. With the middle pool drained and the tank installed we then moved down to the bottom of the dig. The cables just reached the new end point and a pump was dropped into the pool to drain the last of the water, the system above ran unattended clearing the water in record time. With the water gone, the digging could now start. Kieth attacked the dig face, concentrating on the area straight ahead. After a few minutes of work with the shovel, a low arch was uncovered, under which was hard packed silt. Attention was also given to the passage that has now appeared on the left. This contained much softer infill and was much more pleasant digging. After an hours work we had achieved as much as could be done with the four of us, so headed out for tea and cake at the Club in readiness for our caving trip. Yorkshire is so full of caves it seems a pity not to take in as many as possible, so after doing Calf Holes and depositing Donna back at the bunkhouse, we went out to find Roger Kirk Cave, which although not very long, sounds very interesting according to the description. Finding it, though, was a bit of a mission. We found a cave entrance that fitted the description but was a very narrow slot down, and I managed to get totally wedged! After 2 attempts we gave that one up and later worked out I was trying to get into Yoga Cave (no explanation needed). There was an obvious cave entrance further down the hill, and although it didn't fit the description of Roger Kirk Cave, at least we could get into it! So we explored this cave along some lovely meandering pasages, under and over boulders and along a flat-out crawl, to a point where a small chamber seemed to signal the end of the cave...unless the way on was a slot between two rocks...after poking a head through it did look like the cave went on, so I wriggled through the slot, contorted myself back upright and tried to squeeze over a sharp rock - where I stuck fast! I was not a happy bunny at this point and was much happier once I'd relaxed and managed to wriggle back off the rock and through the slot. We found out later that we'd actually been exploring Runscar Caves and that actually is the way on, but I'll leave it to Mel or Keith to go first next time! Not to be deterred, Mark was still looking for Roger Kirk Cave once we were back above ground, and this time he found it! Like a ferret down a drainpipe he was down into it but I had to drag him back because we were near the call-out time (and I'd had enough caving for one day! ), so Roger Kirk will have to wait for another day. After Andy and Mel had kindly taken us into p8 to practise rigging, we thought it would be a good idea to go again while everything was still fresh in our minds. Having left a call-out with Andy we had a great time mooching around p8 and exploring 'Pete's dig', which we had ignored the previous trip. All went well with the rigging and we were out in plenty of time. Whilst in South Wales this weekend I decided to lift off the tin lid to the Brickworks Dig and venture down to see what state things were in after the long wet summer and winter lay off. Despite heavy rain in the night, the dig was relatively dry. The conveyor belt was completely dry down to the cross rift and you could see right to the dig face. A few inches of water were held behind the sand bag retaining wall we had built, with the last twelve feet as you approach the dig face being a static pool. No significant collapses had occurred while we have been away. Inspecting the dig face indicates that there is definitely a passage on the left, two feet of clear passage roof can be seen, that reflects the roof of the main passage. Ahead the wall continues to dip and probably continues, but spoil and water prevent you seeing this conclusively. New pumps, some dry weather and a little enthusiasm may see some progress in the dig this year!